Picture above is the entrance to La Mamola from the N340 LA MAMOLA - La Mamola is a small village in the real Spanish style. Village populations is about 900 people, there are 2 supermarkets, 2 Fishmongers, 4 bars and restaurants (8 over season time), Chemist, Post office, Bank, 2-3 small gift shops, bakery and a doctors surgery and a lot of very nice people in the Village. This is an agricultural area, with greenhouses and fields supplying vegetables and fruit for the supermarkets of Europe and sheep and goats grazing the hills. The best selling novels 'Driving over Lemons' and 'A Parrot in the Pepper Tree' by Chris Stewart are set only a few miles away. In addition to the drives through the local countryside and the other beaches of the Costa Tropical, the location is ideal for anyone looking for peace and quiet. Just an hour away you can enjoy skiing & snowboarding in the Sierra Nevada. 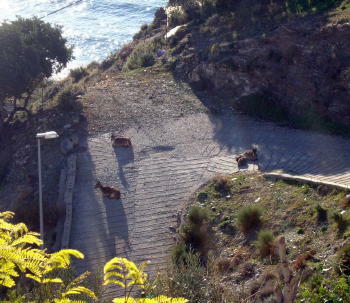 You can also drive up through all the beautiful mountain villages of The Alpujuras. 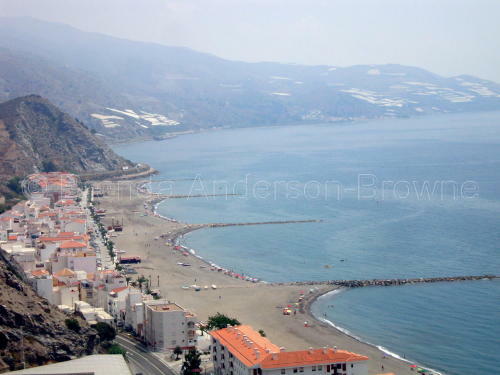 The tower Cautor is part of the network of watchtowers built along the Granada coast in oldern times to monitor the possible arrival of ships, enemies or pirates. 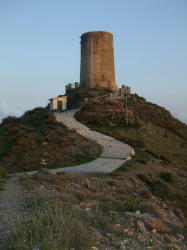 The Cautor tower of La Mamola, is one of the oldest in the coastal province as it was built in the mid-sixteenth century. La Mamola has Restaurants and bars including Beach Bars in the Summer. It also has 2 supermarkets, Bakers, Fish shop, paper shop, Tobaconnist, Chemist and various other shops. It has a Doctors surgery and post Office. The closest village South is Castillo de Baños and that has a large Fish Restaurant, Camping site with Restaurant, Patio Bar and Swimming pool and a well stocked small Coviran supermarket. La Mamola is heading into Winter now although the days are still hot , the nights have cooled down a bit. This festival revolves around the same tradition of remembering the dead. It is not surprising that we remember the dead in Autumn, when nature dies little by little and prepares for winter. There are many traditions connected with this time of year : from literary references (D. Juan Tenorio by José Zorilla; El Estudiante de Salamanca by José de Espronceda...) to purely gastronomic ones which brings us to the pleasant aspect of this time of year in Spain, the celebration of "La Castañada". In olden days, "la castañada" was celebrated after the family evening meal, and brings back memories of the ancient funeral meals. 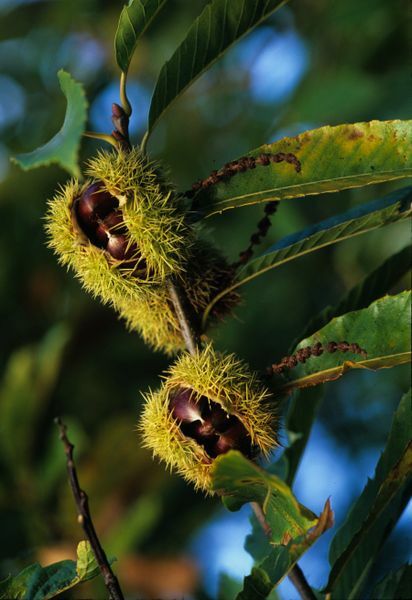 After the usual family supper chestnuts were roasted in the open hearth, "panellets" (small, tasty almond cakes) and other sweet titbits were eaten, and accompanied by a sweet, white wine. 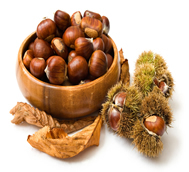 The chestnuts were roasted and placed on the table where everyone was able to eat their fill. This custom of eating chestnuts (which is the typical seasonal fruit together with dried fruits such as almonds, hazel nuts...), goes hand-in-hand with eating sweet potato el boniato. 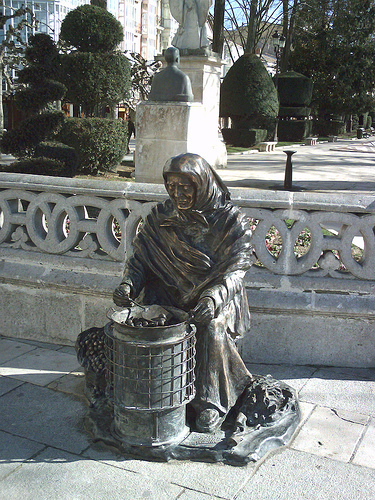 Together they lead us on to the appearance of one of the most lively and important characters at this time: the chestnut seller "la castañera". Here is Spain many stories are told about "Maria, la castañera". December 6 - Constitution Day Día de la Constitución The constitutional history of Spain dates back to the constitution of 1812. After the death of dictator Francisco Franco in 1975, a general election in 1977 convened the Constituent Cortes (the Spanish Parliament, in its capacity as a constitutional assembly) for the purpose of drafting and approving the constitution. A seven-member panel was selected among the elected members of the Cortes to work on a draft of the Constitution to be submitted to the body. These came to be known, as the media put it, as the padres de la Constitución or "fathers of the Constitution". These seven people were chosen to represent the wide (and often, deeply divided) political spectrum within the Spanish Parliament, while the leading role was given to then ruling party and now defunct Unión de Centro Democrático. The constitution was approved by the Cortes Generales on October 31, 1978, and by the Spanish people in a referendum on December 6, 1978, before being promulgated by King Juan Carlos on December 27. 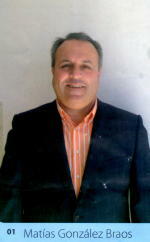 It came into effect on December 29, the day it was published in the Official Gazette. Constitution Day on December 6 has since been a national holiday in Spain. This is the public holiday of Immaculada (Feast of the Immaculate Conception) Feast of the Immaculate Conception (Inmaculada Concepcion –National Holiday) It is a public holiday in Spain and, for many this is when Christmas officially starts. The feast was originally called the Conception of Mary and arose in the Eastern Catholic Church in the seventh century It spread to the West in the eighth century, and in the 11th century received its present name, the Immaculate Conception. In the 18th century it became a feast of the Roman Catholic Church. 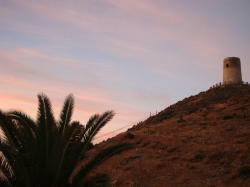 December 21 – In a few cities including Granada the celebration of Hogueras (bonfires) takes place. This date marks the winter solstice (shortest day) and where it is celebrated involves people jumping through fires to protect themselves against illness. All over Spain people never stray far from a TV or radio as the Christmas lottery is drawn over a period of many hours. Everybody in Spain buys tickets for this lottery in the hope of winning El Gordo (the fat one) and the winning number usually means that a good number of people from the same village become a lot better off overnight. Besides the big three prizes there are thousands of smaller prizes shared by people all over Spain. The numbers are chanted by School Children and it is all you can here when passing homes, bars and restaurants on this day. By the time the singing has finished, the lives of thousands of Spaniards will have changed for ever. Many will be millionaires. Whole villages will begin a new life of prosperity. Children yet unborn will stand to inherit fortunes. December 24th - Christmas Eve - known as "Nochebuena" (the Good Night). An old Spanish saying is "Esta noche es Noche-Buena, Y no es noche de dormir"
(Tonight is the goodnight, and it is not meant for sleeping.) It is a time for family members to gather together to rejoice and feast around the Nativity scenes that are present in nearly every home. The Christmas Eve gaiety is interrupted at midnight by the ringing of bells calling the families to La Misa Del Gallo (Rooster's Mass). It is called the "Mass of the Rooster" because it is said that the only time that a rooster crowed at midnight was on the day that Jesus was born. Christmas dinner is often eaten late at night, but before midnight on Christmas Eve so that families may attend mass. It is a family feast, and often highlighted with Pavo Trufado de Navidad (Christmas turkey with truffles; truffles are a mushroom-like delicacy found underground). After the meal, family members gather around the Christmas tree and sing Christmas carols. Children may receive a small gift on Nochebuena or this morning but the day for presents is 6th January, Epiphany, when the Three Kings bring gifts for the children. December 25 - Christmas Day Día de Navidad Christmas Day25th December is a national holiday in Spain so shops are closed yet it is not a day of great celebration but rather a calm day when people go out for a walk, drop into a bar, etc. Another large family meal at lunchtime is common though it's becoming more common to see families eating out on the afternoon of Christmas day. 31st December - New Year's Eve is known as NocheVieja. It is a big celebration all over the country with street parties and special nights in hotels and clubs everywhere. Until midnight people tend to stay at home and on the stroke of midnight it is traditional to eat 12 grapes, one on each stroke of the clock to bring good luck for the new year. In Madrid and other main cities revellers congregate in the main square (Puerta del Sol in Madrid) and eat the grapes along with a celebratory bottle of cava then head out into the night until after sunrise. On January 5th in most Spanish towns is the "la cabalgata" (the calvacade) which is a parade marking the arrival of the Three Kings. The Three Kings ride on floats throwing candy to the children. 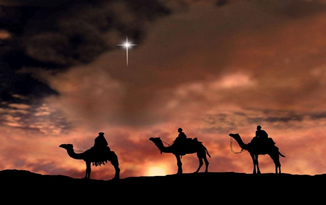 In the Canary and Balaeric Islands the Three Kings arrive by ship! After the parade the children return to their homes to prepare for the arrival of the Three Kings. They place their shoes on the windowsills and fill them with straw, carrots and barley for the donkeys of the Three Kings. Sometimes they might also leave some food for the Three Kings. The next morning the children wake up early to open their presents. Although the children like all of the Three Kings, their favorite is Baltasar because he is the one who it is believed actually leaves the gifts. This is also the day that adults will get their presents although of course these are not delivered by the Three Kings. On January 5th there is a smaller lottery called "el nino" or "the little one". There are also lottery drawings throughout the year.